What's a 30 Point Buck Burger?! Stop into Buck’s Restaurant in Ishpeming and try the 30-Point Buck Burger today! Ishpeming, Michigan – November 8, 2016 – What you’re looking at is a 30-Point Buck Burger! Mmmmmm good! 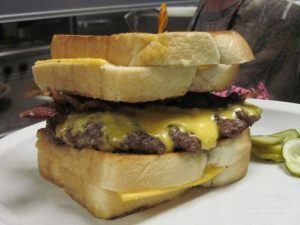 This unique burger has one-half pound of fine grilled meat, two grilled cheese sandwiches on homemade bread, bacon and cheese, and whatever condiments you would like! The only place you can get this great burger is at Buck’s Restaurant in Ishpeming. This is a special that is available only at Buck’s during deer season. You have to try it to believe it! We also have a special mushroom & swiss burger, quarter or half pound. On this burger you can add what you want and it’s covered in a special mushroom savory sauce. This is another special for deer season. Check out the other daily specials at Buck’s restaurant’s Facebook page. Each day specials are listed. Check it before you go, you might find something that you like! And don’t forget, if you enjoy chicken, lake trout, and whitefish, this special is available every day. And they are all you can eat items! So head for Buck’s Restaurant and get that 30-point Buck Burger now!